Giant galloping tarantulas, a war society of crows, and a world-devastating conflict known as “The War of Sorrows” are but a few distinctive features of Allen Turner’s cutting-edge role-playing tabletop game, Ehdrigohr. Ehdrigohr involves nine tribes waged in war across two continents, explained Jason Lewis at the second lecture of the Initiative for Indigenous Futures Speaker Series on Friday. Lewis, co-director of Aboriginal Territories in Cyberspace and host of the lecture series, invited game-designer Turner to introduce and explain the unique indigeneity of Ehdrigohr. In the days leading up to the lecture, Lewis and a small cohort had a chance to play the game. Turner, who has lived his whole life in Chicago, identifies as Black, Lakota, and Irish. He created Ehdrigohr from a Lakota and North-African Indigenous perspective—something he wasn’t able to do while working for corporate gaming organizations. As a “survival horror game,” Ehdrigohr infuses Indigenous ideology with inspiration drawn from creations like The Walking Dead, I am Legend and Princess Mononoke. During the late 1980s and early 1990s, Turner worked closely with disenfranchised youth in Chicago through the American Indian Association. Drawing from his own experience, aspects of his game relate to challenges and barriers that people—especially marginalized communities—face daily. 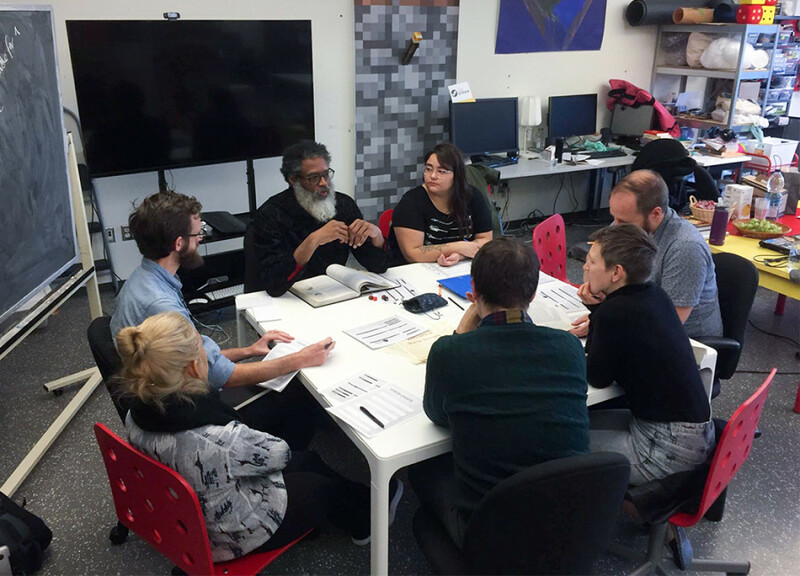 The game requires introspection and improvisation from participants, where players are required to create new identities and make decisions on how to deal with conflict. “It is about struggling with being who you are, despite the big things going on around you,” said Turner. Ehdrigohr serves as an imagined escape from the otherwise inescapable realities of colonial relationships. “I didn’t want a colonized world,” Turner explained. In other games, native people are often represented as the weaker group in need of a saviour. In order to break this negative stereotyping, Turner wanted natives within the cultural space of Ehdrigohr to be considered powerful, capable and magical. “The game is a human-centric world, but the vision of the world and the people is filtered through native ideals, as opposed to a European mindset,” Turner said. Consistent with many Indigenous traditions, an acute awareness of one’s narrative is vital for surviving the game. “The story of your people, where you’ve been and where you’re going is very important,” Turner clarified. But storytelling is just one Indigenous tradition present in the world of Ehdrigohr. “Tribalism is the norm. There are tribal social structures, seen as civilization, not other things that have to be remedied, fixed or educated,” Turner further explained. By exemplifying the power of the imagination and the potential of innovative game designs, Ehdrigohr makes the impossibility of decolonized realities possible. Other essential features of the game include rites of passage, poetry, and surrender to inevitable change. Characters that players might encounter include monsters called “Shivers.” They must be battled in the night, and spirits, such as one named Sorrow, that infect a young girl if she is forgotten for too long. One of the most important objectives of the game is for players to survive dark and heavy winters, a reflection of forces that Lakota people, and Turner’s own tribe, have faced for generations. Within the game’s experience, Turner revealed that “there’s no wrong way to play,” and plenty of room for innovation and creative collaboration. Some thematic hooks offer starting points, but do not restrict the player from transforming, changing and deconstructing scenarios and their outcomes. Another important feature of Turner’s imagined realm is that it is accessible and open to anyone interested in playing, not just Indigenous peoples. During the question and answer period of the lecture, a participant asked what it would be like for a table of non-Indigenous players to engage in Ehdrigohr. “I want people to own the game,” said Turner, as he encouraged participants to accept the major Indigenous lens of a multi-layered inter-connectedness, but to also reach into the traditions and cultures with which they’re more familiar. Those interested in learning more about or purchasing the game for play can find it on Ehdrigohr’s website. Let the decolonized games begin.